Heat olive oil over medium high heat in a small skillet. Add garlic and saute for about a minute, until it just starts to brown. Pour into a big bowl and let cool a bit. Add tomatoes, balsamic, basil, and salt and pepper to the garlic and toss to combine. Give it a taste and add more basil and salt if needed. 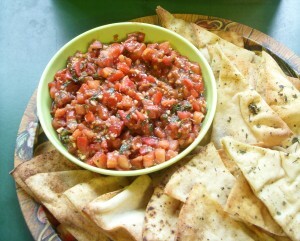 Serve with pita chips, or if you are making it as an appetizer served at home, then serve it the traditional way – on thin slices of warm crusty bread.